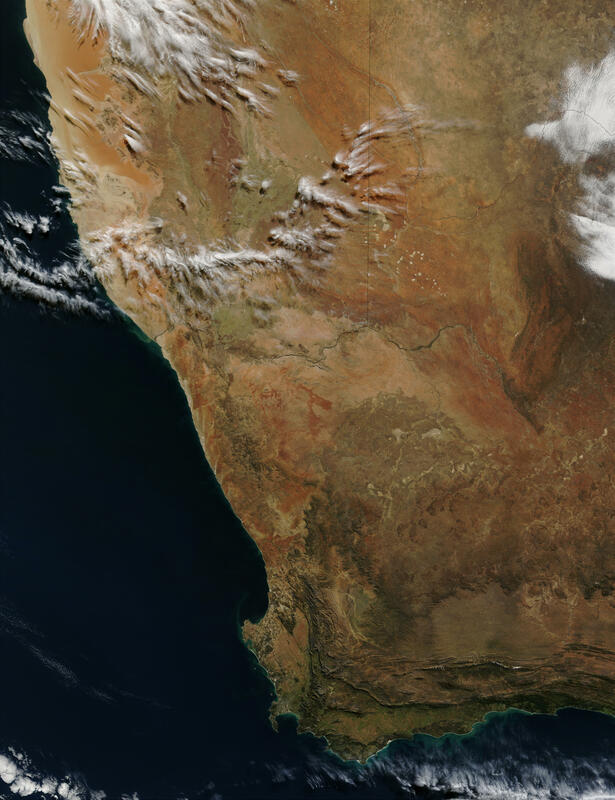 Pale green vegetation and red-brown deserts dominate this MODIS image of Namibia (left), Botswana (upper right), and the Republic of South Africa (bottom) acquired on June3, 2002. In central Namibia the mountainous terrain of Namaqualand is sandwiched between the Namib Desert on the Atlantic Coast and the Kalahari Desert to the interior, where white dots mark the location of small, impermanent lakes and ponds. Namaqualand is home to numerous rare succulent plants that can survive on the region.s scant rainfall as well as fog that blows in off the ocean. Namaqualand extends south of the Orange River, which runs along the border of Namibia and South Africa and into that country.s Northern Cape region. The Orange River extends almost all the way back through the country, and where it makes a sharp southward dip in this image (at lower right), it runs through the Asbestos Mountains, names for the naturally-occurring asbestos they contain. In southwestern South Africa, high plateaus, such as the Great Karoo become mountain ridges near the coast, and the city of Cape Town is visible as a grayish area of pixels on the north shores of the horseshoe-shaped False Bay at the Cape of Good Hope.